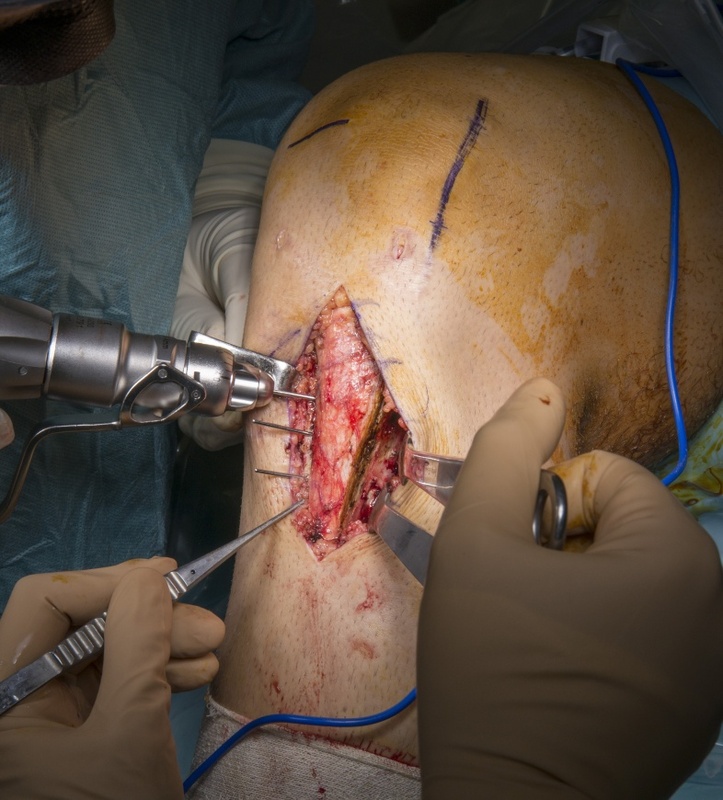 Learn the Anteromedialisation tibial tubercle osteotomy surgical technique with step by step instructions on OrthOracle. Our e-learning platform contains high resolution images and a certified CME of the Anteromedialisation tibial tubercle osteotomy surgical procedure. Fulkerson originally designed the tibial tuberosity anteromedialization technique to address patellofemoral pain associated with patellofemoral chondrosis in conjunction with patellofemoral tilt and/or chronic patellar subluxation. It was devised to overcome the significant complication rate associated with the Maquet (anteriorisation) procedure. The anteromedialisation transferred areas of patellofemoral loading through medialisation, which also improves patellofemoral joint congruity (improved joint contact area), and anteriorisation to transfer forces proximally, while theoretically decreasing the absolute magnitude of the patellofemoral resultant force. This theoretical decrease in resultant force and increase in contact area would thus decrease joint surface stress, potentially decreasing the condition of overload contributing to pain. Currently, interest has been renewed in anteromedialisation in conjunction with cartilage restoration of the patello- femoral compartment. Results of cartilage procedures are improved when the patellofemoral forces are minimised. The examination of patient should include assessment of coronal alignment, rotational alognment, patella height and the Q-angle. Evidence of retinacula tightnes should also be undertaken. All patients will undergo a pre-operative MRI and rotational CT scan in order to assess patient alignment. The MRI is used to assess Patella height and the chondral surfaces of the patella. The CT scan is used to assess the patients rotational profile and the Tibial Tubercle Trochlea Distance. Prior to surgery all patients should undergo a period of conservative treatment which includes physiotherapy, directed at core stability, hip rotators and lower limb strengthening. This can be combined with oral analgesia, activity modification (to avoid impact and open chain exercise) and potentially intra-articular injections.